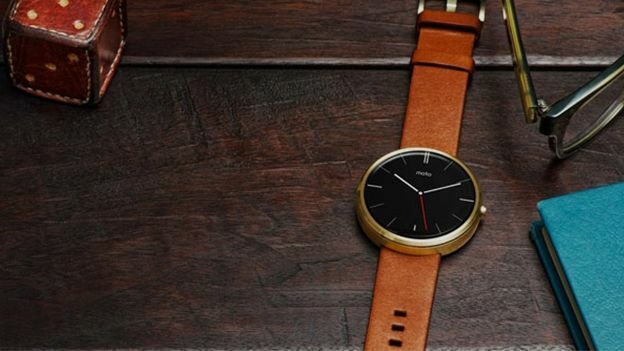 Motorola has launched its Moto Maker personalisation tool for its Moto 360 smartwatch. Previously available for the Moto X, Moto Maker lets you choose the materials, colours and finishes for your gadget, so you can have a smartwatch that's like no other. It's not completely open-ended though. You can choose from three case finishes – dark metal, light metal or champagne gold – and nine bands, including leather, metal and mono-link (Motorola's take on the classic bracelet style). Then pick one of 11 watch faces, and you're done. The watch faces are swappable after the fact through downloads on Google Play. So no problem if you tire of that Mickey Mouse one you once found so endearing. You will have to pay more for certain flourishes. Metal bands cost an extra £30, while the Light Gold housing will set you back an extra £50. But those aside, you pay the same £199 as you would for a standard Moto 360. We've had a play, and despite our best attempts, it's hard to make something unsightly. Though it is easy to rack up a big bill – our smartwatch hit £279.99 before we knew it. Moto Maker took a while to come to the UK, but it offers something different from other devices. Android Wear is going to need all the help it can get when the Apple Watch launches. One analyst predicts the first-day sales of Apple's timepiece will eclipse all of Android Wear's sales so far. Ouch. The Apple Watch isn't without fault. It will need charging every day, and some have questioned the usefulness of having a small screen on your wrist. These problems plague nearly all smartwatches so far, but that hasn't stopped sales surging: one market research firm predicts 91.6 million of the devices will be sold in 2018.